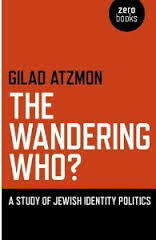 Gilad Atzmon’s book „The Wandering Who“ about Jewish identity politics has, since its publication three years ago, sparked most different reactions as well as particularly lively debates, as a glance on the controversial author’s Wikipedia page shows. Some view him as an inspired fighter for justice, as an undaunted source of ideas and impulses, even a prophet, while others despise him as an „anti-Semite“ and demonize him as a soul catcher in the quagmire of extreme right-wing ideas. What’s in this prophetic devil’s book? What do people say about it? What is to make of it? PART 1: WHAT’S IN IT? What happens on the 202 pages between the two covers resembles an elaborate jazz piece in its composition: Themes are employed and varied, circles closed, biographical details interpolated. At the heart of the study are – in a nutshell – two major theses: that there is a political ideological „Jewish-ness“ which by far exceeds the boundaries of Zionism, and that, in this context, there is a deep gap between tribal interest politics and universal standards within the range of Jewish opinions: Jerusalem versus Athens, known from the problem of the Jewish vs. the democratic state. In 22 chapters, organized in four parts and supplemented by diverse fore- and afterwords, the author analyzes the heterogeneous Jewish collective from which he originates, often in a context with the Israeli crimes against the Palestinians. The self-critical impulse at the root of his criticism can be understood while reading the epilogue, where Gilad Atzmon recounts an episode from his school days in Israel: On a visit to Yad Vashem the fourteen-year-old asks the teacher why so many Europeans loathed the Jews so much and in so many places at once. The subsequent punishment did not silence the querist; apparently, similar scenes were to follow. Thus the author self-assesses not to look at Jews or Israelis, but in the mirror (p 94). This is essential for understanding his motivation. Atzmon is a dissident, someone who, during his time in the Israeli army, discovered lies and inconsistencies he started to consequently pursue, as he describes in the introductory part of „The Wandering Who“. What did the first Israeli president mean when he spoke about a Jewish „primary quality“ (p 16f) that ranks higher than civic commitments of Jews toward a diaspora country? Atzmon analyzes Victor Ostrovsky, a deserter ex-Mossad agent (p 18ff), and his description of „sayanim“, diaspora Jewish helpers for the Jewish cause. What enabled Wolfowitz, Greenspan and others to mobilize the USA for Zionist interests? It was in any case no conspiracy, writes Atzmon, for everything was in the open and public (p 30). In the philosophical excursion of chapter 3 he examines the relationship between minority identities and mainstream and finds the case that minority policies are „there to retain the negation“ (p 33). Zionism would be retained by anti-Semitism in the same way. In the actions of minorities like Zionism or lesbian separatism he detects abstract identifications rather than authentic identities and illustrates this thesis by comparing the typical Sabra, i.e. Jew born in Palestine, with a Jewish settler in the West Bank (p 45f). Whereas the Sabra displays the rather artificial „identification with a newly-born Jewish archetype“ the settler would overcome separatism, reaching a new Jewish identity. Yet all of them, as politically acting Jews, would be defined by being „against something, or set apart from something else“ (p 48). A lack of self-reflection is what Atzmon attests in regard to his former in-group, shown also in the benevolence toward positive Jewish stereotypes like Anne Frank; negative ones, like Shylock, however, were rejected (Chapter 5). According to Gilad Atzmon, the haskalah, the Jewish enlightenment, was defective. He views Moses Mendelssohn’s call: „Be a Jew at Home and a Goy on the Street“ (p 55) to be symptomatic. This duality with its intrinsic contradiction was co-responsible for the misinterpretation of both the right and the left in the Jewish discourse who believed in the Zionist creed „that, due to their homecoming, Jews would be able to replace their ‚traditional traits‘ with aspirations towards sameness“ (p 56). Atzmon sums up: „As long as Jews insisted on being like ‚all people‘ they would always fail to be themselves“ (p 60). The same Zionism was to blame for the attempt to supply secular Jews with an identity within its system, and yet, „the notion of peace, reconciliation and harmony entails a collapse of the politics of negation“ (p 64). Here ends part 1, „Identity vs. Identifying“, and part 2 begins: „Unconsciousness is the Discourse of the Goyim“. Atzmon talks about the difficulties in defining „Zionism“ and the overlap with what he recognizes as „Jewish ideology“ (p 69). Especially after the establishment of the Jewish state there were no more common aims to define the concept other than the upholding of tribal interests and, significantly, „prevention of assimilation“ (p 70). As an example for non-believing anti-Zionist Jews, who, due to a „tribal orientation“ (p 72) still call for acceptance in the Jewish community (p 72), thus recognizing it implicitly as a (political) authority, Atzmon analyzes over several pages the case of journalist Julia Ward. If it was a Zionst game one might be able to detect roles in certain people, and the respective individuals are not necessarily aware of those roles (p 76). He describes Zionism as a successfull „global project with no head and a lot of hands“ which „sets out a template for Jewish tribalism by incorporating all elements into a dynamic power, and transforms its opposition into a productive force.“ (p 76). As an example, the author mentions the episode of Sharon’s Kadima party success in 2005, followed by Olmert’s war in Lebanon. He comments: „As much as Zionist Jews want to be protected by walls and by the nuclear deterrent, they also want to be ‚citizens of the world'“ and continues to diagnose a „schizophrenic ideology“ (p 78). The gap between Jewish self-image and reality clearly showed, according to Atzmon, during the attack on Gaza in 2008, when Israel saw itself via al-Jazeera and Press TV through the eyes of the „other“ (p 81f); the „ghetto malaise“ (p 84) would also be obvious in the 2009 Coen brothers movie „A Serious Man“ in which protagonist Larry is more afraid of being caught doing something unethical than of actually doing something unethical (p 82-84). As an escape from the ghetto or shtetl, respectively, of Jerusalem’s insularity, towards the openness of the metropolis of Athens, the author sees three routes: total segregation, return to orthodoxy, or the (favorable) overcoming of what he calls „Jewish-ness“ (p 86f), i.e. Jewish interest politics, and with it the detachment from the tribal obligation. In an excursion of eight pages (Chapter 11) Atzmon analyzes a thesis by Otto Weininger, a forgotten anti-Semite and woman-hater, according to which opposites like man and woman complete each other when the match is in the relation of e.g. 70:30 / 30:70 and positively not in the distribution of 100 % man and 100 % woman. One could only understand those things in other people that one carried with him or her. This would be one of the causes for the „collapse“ (p 92) of the multiculturalism discourse after 9/11 and the failure of the western left to grasp the transformation within the Arab world (p 92). Tribal Jewish politics is to be distinguished from Zionism which is an obsolete concept in Israel, anyway (p 98). Atzmon’s criticism aims at the „invention“ (p 100) of the Jewish nation and the fact that both Zionsts and anti-Zionists give it an identity through supremacist behavior and the promotion of hateful images (p 102). That what sounds self-determined and emancipated was only pretence (p 104) in the tribal discourse. Lenin rejected the self-determination of the Jews because they were no nation to begin with (p 107), while e.g. Palestinians did not need to imitate authentic self-determination (p 106). This pretence of universalism concerned the „progressive“ socialist Matzpen and the „reactionary“ (p 109) neo-conservatives alike, both of whom justified, among other things, „the destruction of Arab regional power and Islam“ (p 109) and thus were „two sides of the same shekel.“ (p 110). In chapters 14 and 15 he continues his thoughts on right/left-orientations in the Jewish discourse. First he analyzes some quotes by the economist Milton Friedmann who predicted „that the short phase of Zionist ‚pseudo-socialism‘ was foreign to Jewish culture“ (p 117). The current financial catastophes, according to Atzmon, were largely in the responsibility of „his own intellectual heritage“ (p 119). After mentioning several quotes of violence from the Book of Moses and after poiting to the countless violent passages in the Bible, the author concludes that „the lethal spirit of the scriptures has infused the essence of modern Jewish political discourse“ (p 122) and was also exercized against the Palestinians – this time not in the name of God, but „in their own name, in the name of self-determination, (…) in the name of ‚democracy‘.“ (p 123). Part 3 is entitled „Historicity & Factuality vs. Fantasy & Phantasm“. Here, the author presents the Pre-Traumatic Stress Syndrome (Pre-TSS) which „is a fundamental tenet of Jewish and Israeli culture“ (p 130). In such instances, the trauma does not need a concrete experience and refers to an „imaginary future“ (p 130), e.g. in the shower scene in „Schindler’s List“ when, instead of Zyklon B, water pours down on the heads (p 130); or in the routinely uttered fear of Israeli politicians of the „nuclear Shoa“ (p 132). The „imaginary terror threat“ in the killing of nine peace activists at the Gaza shore also belonged in this category (p 134). This phenomenon was even captured in the realm of humor; a Jewish telegram reads: „Begin Worrying, Details to Follow.“ (p 134). Studies by Shlomo Sand („The Invention of the Jewish People“) as well as Yeshayahu Leibowitz‘ thesis about the Holocaust religion are reviewed to further explicate the phenomenon of Pre-TSS. The myth of the Jewish nation with its kingdom, exile, wandering and return (p 139) would only exist since 1820, and the Zionist kidnapping of the Bible originally was a desperate Jewish answer to German Early Romanticism (p 140). After concurring with Shlomo Sand that, ironically, it was probably the Palestinians who succeeded the first Jews in lineage, Atzmon returns to the issue of defining „Jewish-ness“ (p 147f) and argues with Leibowitz that the genocide was the only thing that united the Jews. This would not be about a historical narrative, for if it was it would not need the protection of laws and politicians (p 149). The Holocaust became an „ideological interface“ (p 151) for Zionists, Marxists and humanists who flock to the holy core-narrative, the trauma, and this not after 1945, no, since biblical times. The author summarizes: „That which maintains the Jewish collective identity is fear“ (p 156). As old as the Book of Esther (Chap 19), the basis of the Purim holiday, was the Pre-TSS story, as the book deals with an attempted judeocide, and how Jews saved themselves by infiltrating the corridors of power. The scientist Medoff recognizes this scenario with its distributed roles to be similar to the situation in the USA in the 1940s, and Atzmon even sees it as a paradigm that also works with the characters of Obama, Ahmadinejad and Cheney (p 162). This is also why Lenni Brenner’s critique of the cooperation between Zionists like Rabbi Joachim Prinz and the Nazis was inadequate, as such collaborators acted in the spirit of the Book of Esther (p 162f). But: „In order to live out its promise, Zionism had to liberate itself from Jewish exilic ideology, and from the Holocaust religion. Yet it has failed to do this.“ (p 165). Only via „Donations, Think Tanks and Media Outlets“ (Chap 20) it was able to retain its influence. With this thought the summarizing closing part 4 begins: „Connecting the Dots“, in which the Jewish mainstream discourse is reproached with a lack of understanding history, e.g. in the example of the ADL (Anti-Defamation League) when in 2007 it recognized the massacre against the Armenians as genocide, but soon discarded this assessment (p 173). Atzmon explains: „In the Jewish intellectual insular world, one first decides what the historic moral is, then one invents ‚a past‘ to fit.“ (p 174). The Holocaust, that hit the author’s family, too, was indeed bad and tragic, „but not that different from the fate of many millions of Ukrainians“ (p 175), and in this context he also mentions German civilians, Japanese, Vietnamese and Iraqis. He demands: „The Holocaust, like every other historical narrative, must be analysed properly.“ (p 175), for as soon as three years after the end of World War II Palestine fell prey to a Jewish ethnic cleansing (p 177), raising many questions. It was inherent to history that it is constantly questioned and that it does not become an „extended present“ (p 179) in which „the past is sealed“ (p 180). The dismissal of temporality, according to Atzmon, is an explanation for walls, barbed wire, phosphorus and death in the Middle East. Atzmon closes with the remark that, next to Israel, The USA and Great Britain managed to banalize and simplify history, making the „war against terror“ possible (p 183). He summarizes: „To identify politically as a Jew and to wonder what is ‚good for the Jews‘ is the true essence of Jewish tribal thinking“ (p 184). Atzmon does not expect solutions from „peace talks“ (p 187), as he mentions in the epilogue, rather from a „de-Zionisation of Israel“ (p 188) and an „honest process of self-reflection“ (p 189). Regarding the German translation of the book it has to be stated that it is a desaster for the reader, starting with the title. If a publisher is able to integrate so many mistakes of all kinds in a single publication they should think about introducing an editor. PART 2: WHAT DO PEOPLE SAY ABOUT THE BOOK? In the appendix below I have assembled a list of 79 reviews of the „Wandering Who“, including some supplementing material like interviews. A first glimpse shows that the big discussion started with the publication of the book three years ago, in September 2011. Everything is linked to, so everybody can build their own opinion. The scope of this little study is too tiny for analyzing the details of the discourse. As stated above, feedback ranges from the labels prophetic to satanic. Highlights are the articles in Counterpunch (Sep 2011 and Feb 2013), and, on another level, the public collective rejections/disavowals in March 2012, here filed under Abu Khalil and Abunimah. Criticism is largely boring when it concerns the notorious reproach of anti-Semitism that routinely finds volunteers to utter it as soon as criticism of Israel is on the table. Just as boring is the complementary repertoir, ranging from applause from the wrong side over the potential nurturing of prejudice over to entanglements in conspiracy theories and an overall disturbed personality that would normally disqualify the author, if, yes if he was not at the same time a jazz saxofonist of world-class which makes the nobel enterprise impossible. There is a thread in the discourse amounting to nothing more than such superficialities, offering little of substance. The backers often laud the author’s courage to tackle inconvenient truths and taboos. They also tend to summarize and comment on some major theses dealt with in the Wandering Who, namely those of Sand, Leibowitz and Finkelstein, which covers a good part of the feedback. This camp tends to regard his criticism of Jewish mainstream beyond Zionism as an eye-opener. The known German right-wing extremist veteran Horst Mahler took an especially huge effort writing a (kind of) review that is longer than the Wandering Who itself. In the Brandenburg prison, where he is currently detained for sedition and incitement, Mahler seemed to have had the necessary leisure for this little masterpiece that tapers off to a rhetorical firework: „Cleansed from the traces of Jewish Lies the German Volksgeist will shine in new splendor.“ And: „Germanity, due to its spiritual substance, is devoted to the world as the apparition of God.“ This must be the result of a long phase of epiphany and very difficult to capture in words. As the media outlet Die Welt reported, Mahler managed to smuggle this gem into freedom on USB sticks. PART 3: WHAT TO MAKE OF IT? Gilad Atzmon won the battle – and it has surely been a battle – against his former collective, not by virtue of his arguments or something he said, but by showing that he, in fact, accomplished the emancipation he criticizes to be lacking in his ex-group: authenticity rather than futile attempts to live up to an abstract image or semi-conscious pattern. The questions Gilad asks are worth, often necessary, to be asked, like: Who are those people that commit violence with Jewish symbols in the name of the Jews? Or: Why are Jews overrepresented in political bodies like in the UK and the USA? Whether or not the answers and references he provides are sound is another matter. Gilad springs into the eye of a taboo, namely criticism of the Jewish mainstream the mere mentioning of which is problematic, immediately noticable when I replace „mainstream“ with e.g. „collective“. It conjurs up dark shadows of the past, looming over the intellectual capacity of numerous observers. Some of the Wandering Who’s insights are inspiring, like the thesis that you can only understand in others what you carry in your self, although I don’t understand why one would choose to schlepp an individual like Weininger all the way to this point. The Pre-TSS theme is also interesting, it reminds me of my family from whom I learned everything I know about Israel – Mum had always been so concerned that I could fall into depression after a creative high that she acted out of fear, like in Gilad Atzmon’s Pre-Traumatic Stress Syndrome. The family „feared“ I could do harm to myself or others and lived in the expectation of the catastrophe until they finally used violence. They invented a dogmatic group history to their advantage and thought they had special rights. This made them incredibly ruthless. I mention this because my family is not Jewish, and they know nothing about the Book of Esther, either. My point is that Gilad (again) came up with incidences of group behavior and power struggles, trying to sell it as specifically or typically Jewish. As far as I can see, there is no pioneering book yet on power and group behavior from a socio-psychological perspective, classifying the kinds and levels of groups, like family, school class, peers, corporation, office, interest group, army etc. and specifying typical situations, scapegoat practices, mechanisms that lead to leadership, control of the mainstream opinion, competitive behavior as a product of group pressure, identity-building via enemy-making, initiation rituals, intentional vs. unconscious group behavior, the role of loyalty, the role of silence and hypocrasy, and all the other things that go without saying. In this book one would find elaborations on most of Gilad’s interesting remarks. But can’t those remarks still be applied to a Jewish mainstream? I’d say of course, this is what the fictitious deep group analysis is for, it summarizes individual cases. The primal object of observation, though, is group mechanisms and can never be the „essence“ of a group. Gilad is not completely unaware of that, as he states at the end of his book: „However, Israel is not alone. As tragic as it appears to be, America and Britain have managed to willingly give up on temporality“ (p 183) – after having defined „temporality“ and having fitted it into his Jewish-ness theory. As both Gilad and me are musicians, literary writers, free thinkers and Middle East analysts, our paths have crossed several times in the last decade and a half. There is a remark on page 134: „I guess that ‚turn the other cheek‘ is a valid way to defy the Old Testament’s ‚eye for an eye‘. Turning the other cheek is commonly realised as a means to counter an aggressor. However, it maybe the only possible measure to dismantle the ‚terror within‘, that aggression that brews inside us as we become vindictive. It can also be very effective in defusing our anger at an imaginary threat. We replace it with acceptance, we disarm ourselves. We give peace a chance.“ The remark made me ask Gilad if he had adopted pacifist attitudes now. He answered in an email: „I see myself as a devoted follower of Christ, and turning the other cheek is the essence of de-judification. I am not a pacifist. I support resistance. But I would argue that turning the other cheek is a privilege kept to the stinger.“ – I sat there mouth open, when I saw this fascinating contradiction. Where will Gilad go from here? He obviously digested a lot of input, and his definitions have become refined and more cautiously chosen over the years, see e.g. : „The notion of ‚Jewish Power‘ could be confusing and misleading: it needs elaboration. When I discuss Jewish Power, I am strictly referring to the ability of Jewish interest groups to mount political pressure.“ (Silvia Cattori interview Sep 2011). Gilad’s leitmotif lies in the demand for opening the discourse, and this is indeed a central issue, especially when one considers the media situation in the awareness that war is always better for the media than peace because conflicts and power struggles simply sell better. Yet when in a long online talk last March the interviewer John Friend repeatedly talked about the „alleged Holocaust“ Gilad did not object to this choice of words. His respective responses, however, presupposed the existence of the Holocaust. In the same interview he ascribed – half as a joke – special abilities in the field of self-marketing to Jews, listing some examples, among them, strangely, himself who is supposed to have left all these things far behind. „Mirror criticism“ is my expression for projections of self-criticism onto others. When, for instance, someone tries to dominate the discourse by accusing others of dominating the discourse. Or when you exclude (disavow) someone on the allegation that this person excludes people. Or when someone fixated on „anti-Semites“ blames someone else for being fixated on „Jews“. Some are hurt in their egos and, surprise, they see Gilad’s big ego. Those, who allude to Atzmon’s confusion, often are confused by his demand to not confine criticism on Zionism when discussing Jewish identities. What we get here is an unfettered view into the eco system of the Middle East discourse. Let’s learn from that!